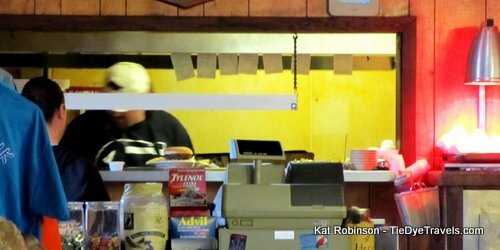 It was a call to check out a mammoth burger that brought me to the door of the Pig 'N-Chik in Sherwood. Mind you, I wasn’t crazy enough to try one of the places’ four pound Sarge burgers, but I was willing to give a half-pound hubcap a try. The Pig 'N-Chik is a standard in the area for barbecue… with a sweet honey sauce and fall-apart ribs. People have recommended the place to me for the excellent catfish, both the cornmeal-battered version and Friday’s special of smoked fish. One of these days I’ll venture back over to find out more for you on that. But this burger… came with a lot of recommendations. So I went in one afternoon and placed my order. 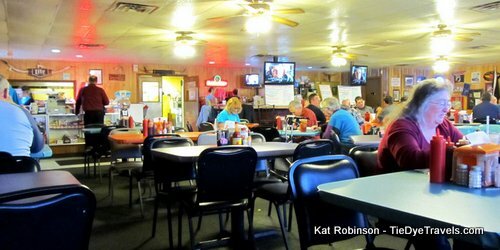 I have to tell you, I’m glad I had a clue what I was going to order first… because the menu is a front-and-back melange of every sort of Southern prideful item — po’boys, BBQ nachos, chicken salad sandwiches, smoked sausage, PurpleHull peas, a Reuben, country fried steaks and a range of fried rice dishes. On the board was the daily plate lunch special (Roast Beef with two sides) and an array of desserts including blackberry cobbler and lemon ice box pie. The oversized dining room was well-stocked with blue collar workers, seniors out for the day and BS artists telling fish tales in the corner. I watched order after order come through the window, dispersed to the appropriate tables with an almost clockwork precision. The kitchen sounded busy behind that window. 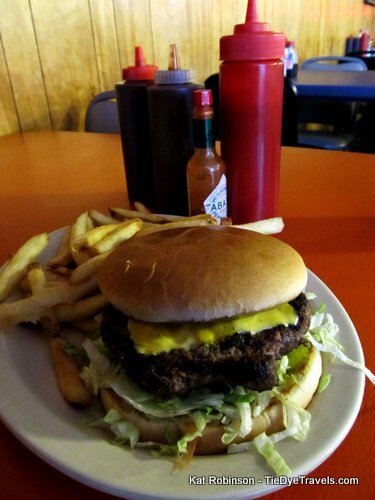 Didn’t take me long to get my burger, a plate-eating hubcap on a big seedless bun, a big thick smoky-scented burger atop a pile of shredded lettuce. The toasted bun had mustard on the top bun (a little much for my taste), mayo on the bottom, ridgy hamburger dills and just a hint of tomato. 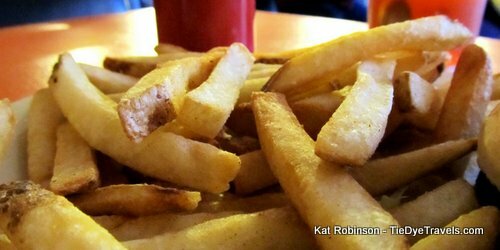 It comes with thick yellow fries and American cheese for $5.75. We’re talking a lot of food for a good price. So how’s the burger? It’s big. It’s eight ounces and seems like more. Better yet, it’s char-grilled and has a nice smoky flavor that could only come from hardwood smoke. Somehow it’s picked up some of that fabulous flavor from the smoker (proximity? Perhaps.) and taken it through to a nice finish. If I’d realized I’d had a choice of cheese I’d probably have gone with Swiss. Cheddar, Hot Jack and Mozzarella are other options. The fries were typical but not too bad. Yes, I will be back. 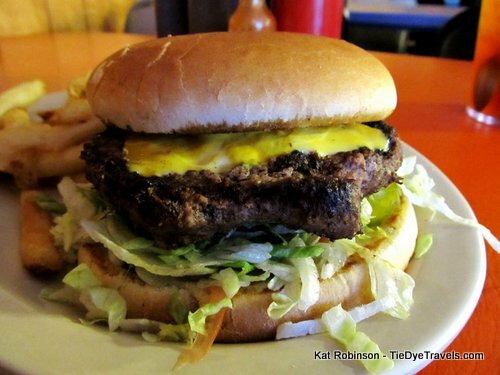 I have this feeling of doom that before the year is out I will do a story on the most outrageous burgers in the state, and the Sarge (four pounds of meat on a one pound bun, $19.99 or free if eaten within 30 minutes) sounds like a contender. I won’t eat it alone, though. 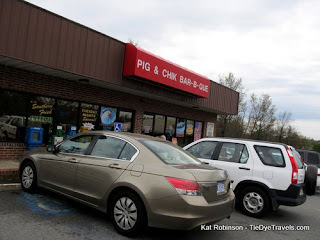 You’ll find the Pig ‘n-Chik on Highway 107 in Sherwood. It’s open Monday through Saturday 10:30 a.m. to 9 p.m.. (501) 834-5456 or check out the website.